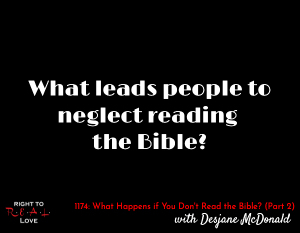 In this episode, Yahnathan continues his discussion with Desjane McDonald by addressing the question: What leads people to neglect reading the Bible? What leads people to neglect reading the Bible? The challenge of balancing routine and flexibility when reading the Bible. Why Yah appreciates you being genuine and honest with Him. Why your relationship with Yah is unique from others. Jay opens up about the challenge he’s encountered with reading the Bible consistently. Be honest with Yah about how you really feel about reading the Bible. Ask and contemplate the question “What is the Bible to you?”. Begin reading the Bible today.